On 7 December 2015 the Institut für Europäische Politik e.V. (IEP) Berlin together with the Institute for European Policies and Reforms (IPRE) in Chișinău held a successful anti-corruption conference in Moldova which was dedicated to the topic “Together with Civil Society against Corruption”. The event concluded the foregoing workshop series, organized by IEP and IPRE to train civil society representatives on how to monitor and influence anti-corruption reforms in Moldova. 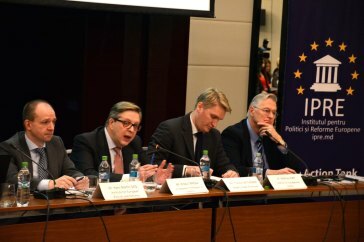 The conference was opened with speeches from Mr. Pirkka Tapiola, the Ambassador of the EU Delegation to Moldova, and Mr. Thomas Weithöner, Deputy head of mission of the German Embassy in Chisinau. International experts, local state and civil society representatives discussed on three panels key recommendations regarding law enforcement, public administration reform, and the role of civil society in the anti-corruption reform process. Due to its prominent speakers and experts, the conference was widely reflected in Moldovan media. Among them were former foreign minister of Georgia and head of the Georgian Institute for Strategic Studies (GISS), Eka Tkeshelashvili, Romanian policy analyst Ana Otilia Nutu (EFOR), and the Deputy Chief Prosecutor of the Romanian Anti-Corruption Directorate (DNA), Mr Nistor CALIN. The programme is financed by the German Federal Foreign Office.